The bees came about because every icon idea we tried to literally represent those sections’ “posts”, “forums” and “topics” were too similar to other existing icons in the menu or too ambiguous or just plain dull. In the end we threw around some ideas which would simply be memorable and maybe have some semblance of a hierarchy to them. The hierarchy thing didn’t really work out 100% in the end, but the icons are certainly memorable, plus it gives me a few graphic motifs to use in bbPress collateral. Wow! The future bbPress looks incredible. Fantastic work Sam! Is there a planned target date set for it? Love it. Similar but different. I also love the icons, as it is “bee bee Press” after all. Plus, if we’re going to over think this, Bee’s and hives represent a colony, and forums are basically the same thing; a colony of users. Or, maybe you guys just love sweet, sweet honey… Just a bunch of Pooh Bear’s surrounded by empty glass jars hoping Matt will send another shipment this month to keep you motivated. maybe at least a month – as target release? Sam is showing how THIS WEBSITE will look soon, the new theme. I’m delighted to know that people are giving their time to work on new versions. I like BBPress and want it to continue. Look awesome…! Getting closer of the wordpress.org theme, unity… I like it ! I like the layout, but only wished, that bbpress would have some options by default. Looks great! Thanks for the update. but I think avatars is too big! Looking forward to the new look. Sam, we getting close? Honestly can’t say I’m a fan of the green, and I’m not too sure what the red, green and white dots are for either? I don’t want to be the only person with issues, but I’m sure you guys are capable of handling criticism. Outside of those two things, I think it’s looking pretty darn snazzy. Can’t wait to see it go live! That’s for support tickets, IIRC. I wonder if a key/legend somewhere conspicuous on the page wouldn’t be a benefit? There have been talks about retrieving Sam’s work and getting it done, but I doubt it’s a priority. Consider it to be planned for ‘further down the road’. bbshowcase is not an official part of bbPress (i.e. no direct affiliation with Automattic); I believe it was once maintained by an active bbpress community member and plugin contributor, who sadly does not think as highly of the project any longer. I still have the files for this design, I don’t think anyone ever asked me for them when I left Automattic. I think there are bigger plans for WordPress.org now that supersede this work, especially if bbPress becomes a canonical plugin. Why anyone don’t ask? Design is pretty good! Why don’t you attend a meetup on wednesday on IRC and put forward the point of the new design? I really love that one and also tried to copy some bit of it. 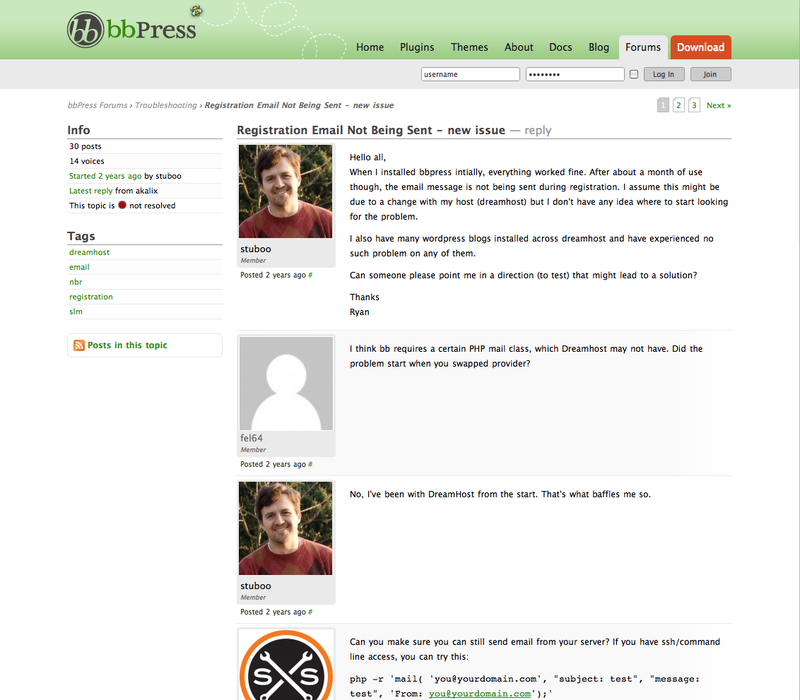 The bbpress 2.0 template looks nice. The new order with the forums on the left site and the recent discussions on the right site is excellent. Hope that it will be published soon. I also dig that design very much and was expecting it real soon. This appeared on the newly launched wp-ui mailing list. 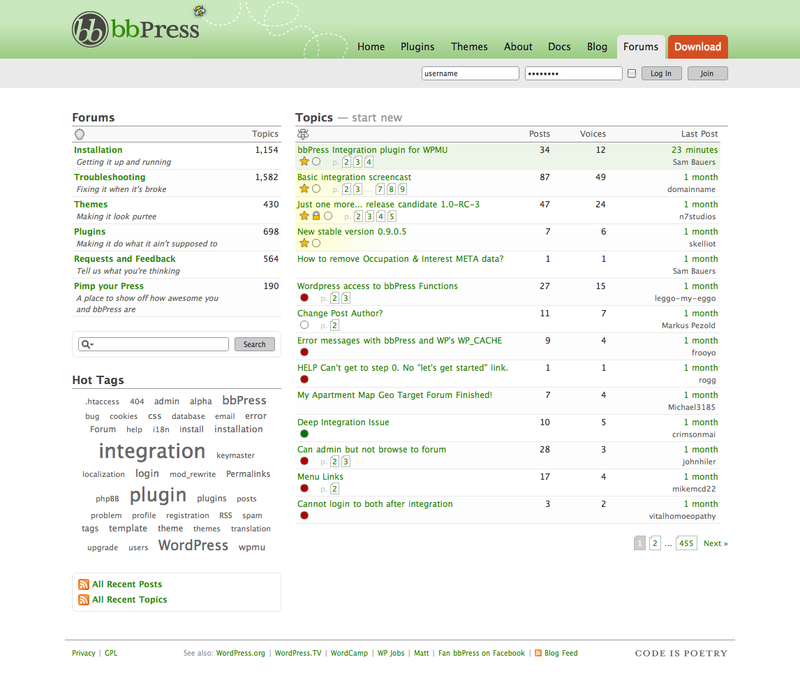 There was talk in one of the meetups, or maybe email, that WordPress.org was getting a makeover, so they didn’t want to emulate the current wp.org in a design for bb.org, then have bb.org stuck with the outdated look (again) once wp.org is redesigned. I can’t find it in the IRC logs so maybe that was in email correspondence.